Few occupations from history are as maligned as that of Medieval-era executioner. Popularly painted as gleeful dispensers of death and torture, the truth seems to be that many executioners throughout this period usually treated the occupation with a certain reverence and exhibited an extreme dedication to duty. Beyond trying to minimize the suffering of those slated to be executed, this was, among other reasons we’ll get into, because it would often mean the life of the executioner if they ever botched an execution or otherwise weren’t extremely professional in carrying out their job. So, moving beyond any Hollywood depictions, what was it actually like to be an executioner in the ballpark of Medieval times and how did someone get the job in the first place? A thing to note before we continue is that the duties expected of and performed by executioners, as well as what life was like for specific executioners, has varied wildly across time and regions. For example, as we’ve talked before, those condemned to death in the Ottoman empire during the 18th century could potentially get off scot-free by challenging the executioner to a footrace. In this case, in addition to doling out lethal justice with their bare hands, executioners also worked as both bodyguards and gardeners. That caveat out of the way, how did one become an executioner in the first place? It turns out that many European Medieval executioners were former criminals themselves. You see, for reasons we’ll get into shortly, the role of executioner was so unpopular that finding someone to do the job often required either forcing someone into the profession or offering the gig to someone who was slated to be executed themselves. In the year 1470, a poor thief stood at the foot of the gallows in the Swedish town Arboga and was waiting to be hanged. The public attending the spectacle had pity on the sinner and when he, to save his neck, offered to become executioner in the town, it was agreed. He was pardoned and the red-hot iron was used to brand his body with both thief and executioner mark. In Germany, on the other hand, as author Joel Harrington notes in a discussion of his book, The Faithful Executioner: Life and Death, Honor and Shame in the Turbulent Sixteenth Century, while “standing executioners on salary were the norm” throughout Germany during the 1600s, for many centuries prior to this it was commonplace to thrust role of executioner upon a victim’s oldest male relative. This all brings us around to why so many avoided the profession like the plague. To begin with, the general consensus among most was that in taking such a job, one was then sure to be damned in the afterlife. This was despite the fact that in some regions, such as France, executioners were by official church decree absolved of the sins committed while performing their duties. This still didn’t stop the general public from considering executioners unclean, leading to the more practical problem with the job- nearly being completely ostracized from society. Coming back to those condemned to die instead becoming an executioner, people seem to have been perfectly fine with this as the criminal’s life would still be forfeit, just in a more metaphorical sense. For example, throughout Medieval Europe executioners were often forced to live in houses outside of the city or town they plied their trade in. In cases where this wasn’t possible, they tended to live near things like public latrines, lepertoriums, or brothels. Executioners were similarly often denied citizenship to the towns and cities they served (and thus had few rights in the town) and were largely barred from holding office or even entering churches, pubs, bathhouses, etc- basically most public establishments were off limits to the executioner. Thus, despite executioners being deemed critical for a society to remain civilised, they were paradoxically generally forced to live apart from that civilised society. In fact, some places across Europe went as far to institute laws specifically targeting executioners and what they could and could not do in their day to day lives. 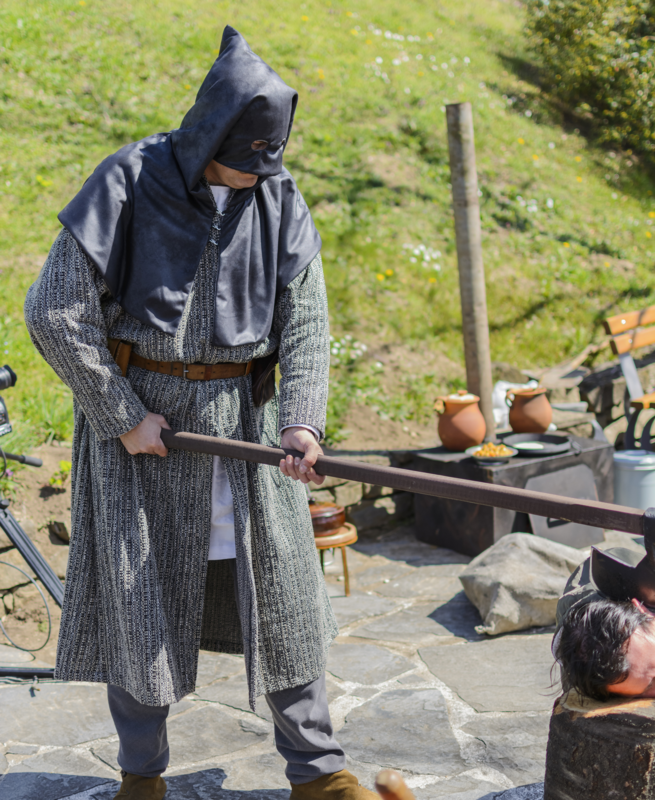 For example, the Bavarian town of Memmingen enacted an ordinance in 1528 that forbade members of the general public dining with an executioner. Such laws and just general attitudes effectively limited the people an executioner could interact with in their day to day lives to their own family and those from the criminal underworld who simply didn’t care that the executioner was unclean. On top of this, an executioner’s children and spouse were likewise similarly shunned by anyone but the underbelly of society. This, combined with the fact that the children of executioners could usually only find mates with children of other executioners, understandably led to the role of executioner becoming a macabre family trade that resulted in executioner dynasties that spanned centuries. Beyond being ostrosised and damning your progeny to a similar life, as well as an afterlife full of hellfire, while there were potentially ways for an executioner to make a killing within the profession, it turns out for most there simply weren’t enough executions themselves to make ends meet. Alternate work was limited to jobs nobody else wanted. This included all manner of things, from disposal of corpses (animal and human), emptying cesspools, collecting taxes from the diseased and prostitutes, etc. Oddly, at least from a modern perspective, another common profession for a well trained executioner was that of a doctor and surgeon. You see, beyond executing people, another thing executioners were often called to do was torture people for various reasons. These two things, combined with the close-knit community of executioners sharing their knowledge amongst themselves, resulted in lifelong executioners generally having exceptional knowledge of human anatomy, and thus they were commonly called on to treat various medical maladies. In fact, one rather famous 17th century German executioner, Frantz Schmidt, noted in his journal that over the course of his near five decade career he had over 15,000 people he treated as a doctor, while executing only 394 and disfiguring or otherwise torturing or flogging roughly the same number- meaning most of the time he functioned as a doctor, despite society at the time considering him an executioner. Schmidt was one of those thrust into the profession as his father was strong-armed into becoming an executioner, condemning Schmidt to the same life once he came of age, though Schmidt’s story has something of a happy ending. Like many executioners, Schmidt was given a wide berth by the public in his day-to-day life, but the incredible professionalism with which he conducted his grisly duties earned him the begrudging respect of both the general public and those in power. In his later years, Schmidt was able to parlay this into a meeting with Nuremberg authorities and then was able to appeal to Emperor Ferdinand II himself, with the goal of restoring his family honor. Swayed by not just Schmidt’s words, but also letters from city council members and other notable people extolling Schmidt’s character and dedication to his duty, the then 70 year old executioner was granted both Nuremberg citizenship and had his family name cleared, allowing his progeny to escape the bloody spectre of his work. Of course, being ultra-professional with the profession was something of a necessity for Schmidt as, at the time in Germany, there was a law stipulating that any executioner tasked with doling out death by the sword (a form of execution largely reserved for especially important individuals) who took more than three swings to behead a victim would be condemned to die themselves. Even where such laws didn’t exist, the job of an executioner was extremely dangerous as executioners were also at risk of being killed either by vengeful relatives or the crowd witnessing an execution. In regards to the latter, if an executioner was especially cruel in their meting out of punishment, simply incompetent to the point that they caused undue suffering, or just otherwise acted in an unprofessional manner in performing their duties, it wasn’t unheard of for a crowd to retaliate by killing the executioner on the spot, generally with no consequence to anyone in the mob. This constant danger of the job was something Schmidt himself talked about several times in his journal, though he only notes one instance where the crowd turned into a mob. This occurred during a flogging he was performing, with the person being beaten ultimately stoned to death by the crowd. As you might imagine from this, in cases like Schmidt who was trained from childhood to take over the job from his father, a rather lengthy apprenticeship was called for, including a robust education from one’s parent, followed by assisting in executions and torture from a young age. Schmidt also notes that he practiced executions extensively on various animals before being allowed to actually execute a human himself. The end goal of all of this was to make sure he wouldn’t screw up, as raucous mobs didn’t really care if it was someone’s first day on the job or not. Now, although being an executioner came with some massive downsides, it wasn’t all bad. Enterprising executioners could actually earn a fairly decent living doling out torture and capital punishment on command if they were smart about it. For example, especially skilled executioners who didn’t mind traveling could take advantage of the scarcity of people willing to do their job by plying their trade across whichever country they happened to live in, rather than just staying local. Executioners also frequently earned extra money in the form of bribes from the condemned or their families, invariably given in the hopes that the executioner would ensure death was as swift and painless as possible, or otherwise allow the condemned extra comforts leading up to the execution. This might include, for example, slipping them extra alcohol or the like to make the execution a little easier to handle. On top of this, throughout much of Medieval Europe a perk of being an executioner is that it was customary for whatever property was worn at the time of death to be granted to the executioner. Additionally, executioners in Germany were frequently tasked with things like arbitrating disputes between prostitutes and driving lepers out of town, among other such jobs, all of which they could charge a premium for because nobody else was willing to do the job. Executioners were also sometimes not just given the job of disposing of animal carcasses, but also in some regions the explicit right to all stray animal carcasses found in a town. Depending on the animal, this could mean the rights to valuable hides, teeth, etc. An even greater benefit for certain executioners, this time in France, was the idea of droit de havage. In a nutshell, because executioners were so ostracized and couldn’t in some regions, for example, just go down to the market and shop freely, under droit de havage, executioners were more or less allowed to tax those who sold various food and drink items. This came in the form of being able to demand goods for free. Finally, there’s the money an executioner would be paid for performing an execution, flogging, or the like. Although it’s hard to say exactly how much an executioner could earn per hanging or beheading in today’s currency due to the inherent difficulty of gauging the value of historic currencies, it’s evident that it was a good amount, at least relative to the generally low social standing of executioners. For example, according to information gleaned from an old statute dated to a small German town in 1276 an executioner could earn the equivalent of 5 shillings per execution. This is an amount roughly equal to the amount of money a skilled tradesmen could earn in about 25 days at the time. Likewise, an executioner operating in England some two centuries later in the 1400s could reportedly earn a fee of 10 shillings per execution, or roughly 16 times the amount a skilled tradesmen could earn in a single day. Granted, as you might have deduced from the aforementioned case of Frantz Schmidt only executing about 400 people and flogging a similar number in his near five decades on the job, nobody was getting rich doing this by itself, it at least wasn’t bad pay per hour of work. Finally, we’d be remiss in any discussion of Medieval executioners to not point out that the idea of executioners wearing masks to hide who they were does not appear to have actually been much of a thing. Beyond, as mentioned, in many regions being literally branded as executioners, even large cities for much of history weren’t actually that large; so people knew who the executioner in a given region was, if not directly, by being marked such. Thus, wearing a mask would have been pointless. What Was It Like to Be an Executioner? How in the world did this subject come to mind? It is so bizarre. Not that you wrote it- just it being there to write. This was very well “executed” and I did my share of laughing through it even though it was not meant to be funny. It was just a subject that was so off the wall and random. A lot of history here and well done with your research. Executioners having a side-job of being surgeons blows me away. The fact that they didn’t ever need a mask to execute anyone shows to the modern person that you can’t believe everything you see or watch on TV when it says it is an historical fact.